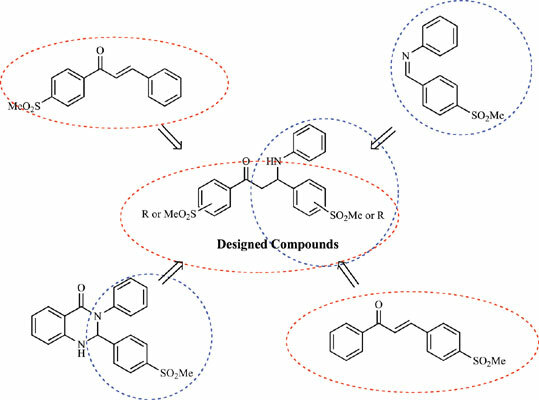 Background: Prostaglandins are a family of eicosanoids biosynthesized from arachidonic acid through cyclooxygenase (COX) pathway. Two isoforms of COX are well established: COX-1, COX-2. Evidence supports the notion that cyclooxygenase-2, plays a crucial role in some pathological conditions such as inflammation and cancer. Objective: A new group of 1,3-diphenyl-3-(phenylamino)propan-1-ones was designed and synthesized to investigate for their COX-2 inhibitory activity and inhibition of platelet aggregation. Method: Docking study was performed using AutoDock vina software. In vitro COX-1 and COX- 2 isozyme inhibition studies were accomplished to obtain structure activity relationship data. The in vitro antiplatelet aggregation activity was determined by turbidimetric procedure. Results: In vitro COX inhibition assay showed that except compound 8c, all derivatives were selective COX-2 inhibitors with IC50 values in the potent 0.20-0.35 µM range with high COX-2 selectivity indexes (SI). Molecular modeling and docking studies indicated that synthesized compounds had a binding similar to that of the known inhibitor SC-558 and the SO2Me group was inserted into the COX-2 secondary pocket (Val523, Phe518, Ile517, Arg513 and His90) and C=O of the central α, β-unsaturated-carbonyl moiety was oriented toward the entrance to the COX-2 binding site (Tyr355 and Arg120). Conclusion: The 1,3-diphenyl-3-(phenylamino)propan-1-ones are novel COX-2 inhibitors with good COX-2 inhibitory and low affinity for COX-1 isoenzyme. Also our results demonstrated that majority of these compounds inhibited AA-induced platelet aggregation. Keywords: Synthesis, 1, 3-diphenyl-3-(phenylamino)propan-1-ones, selective COX-2 inhibitors, platelet aggregation inhibitors, molecular modeling. Keywords:Synthesis, 1, 3-diphenyl-3-(phenylamino)propan-1-ones, selective COX-2 inhibitors, platelet aggregation inhibitors, molecular modeling. Abstract:Background: Prostaglandins are a family of eicosanoids biosynthesized from arachidonic acid through cyclooxygenase (COX) pathway. Two isoforms of COX are well established: COX-1, COX-2. Evidence supports the notion that cyclooxygenase-2, plays a crucial role in some pathological conditions such as inflammation and cancer.